I have had many reasons to go allergen free in the past, but none were as motivating as my current living breathing reason: my newborn son Oscar. I have many food sensitivities that I notice daily unless I eat 100% clean. Even then, I will notice a reaction if I eat too much of something that I am mildly sensitive to such as certain vegetables! I have been eating moderately clean my entire pregnancy, gaining less than 25 lbs, and my eczema disappearing for most of it. However, upon delivery, my hormones are out of whack and so is my body. My eczema is flaring up once again. Oscar is also developing a rash. I don’t know if it’s eczema yet. I think it’s newborn acne at this point, but in a bid to avoid the occurrence of eczema and allergies I am trying to keep him away from the common culprits: dairy, soy, corn, wheat, excess sugar, etc. as well as giving him a daily probiotic. Unfortunately, when both parents have allergies or asthma, the offspring is nearly 100% likely to have them as well. And it is because of all of this that these pancakes were born. I swear they are the best pancakes ever, and Yuri agrees! I am not saying that you can eat pancakes every day because they are allergen free, but they are there when you want something special. There is no need to feel guilty about indulging in these, and the best part of it is that these pancakes cause me NO digestive distress! 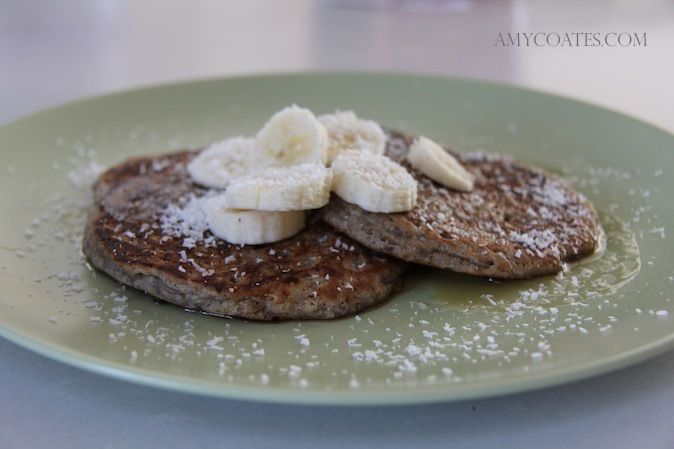 Gluten-Free Banana Coconut Pancakes. They’re vegan AND healthy. If using the egg substitute, mix the egg substitute ingredients together in a small bowl and set aside for 10 minutes. Separately, mix the flour, sugar, baking powder and salt in a large bowl. Add the almond milk, egg substitute, and coconut oil to the dry ingredients and mix well. Add the coconut, cinnamon, and banana. Cook over medium heat until done, flipping once. Makes 6 pancakes. *Lately we’ve been really loving chocolate chunks in our pancakes – the best ones are by Enjoy Life! Gluten free flour making is an intimate thing. There are so many variations out there. This is what I came up through trial and error and it is my favourite gluten free flour yet. I doubt I’ll even try any others. You can use this in any recipe that calls for all purpose flour. Just make up a batch and you’ll have it to use whenever you need it! I buy millet, almonds, buckwheat, and quinoa whole and mill them in the coffee grinder. This way they are as fresh as possible. Tapioca and almond flours I buy already milled. Though you can grind almonds in a coffee grinder – they are super fresh! In Canada you can get almond flour from jkgourmet.com which is what I do now that I’ve found them!